Force India team principal Vijay Mallya believes Formula 1 can make a budget cap work from 2015 despite the failure of previous cost control attempts. Mallya believes those earlier initiatives, dating back to when the FIA attempted to introduce a budget cap of £30 million for 2010, mean a framework is already in place to ensure the new idea can be implemented effectively. Although McLaren team principal Martin Whitmarsh warned that controlling costs in F1 could be impossible, Mallya feels it is the duty of every team boss to ensure the new policy is adhered to. 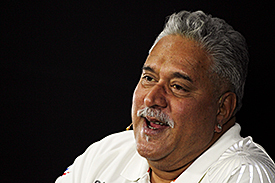 "It is brilliant news," said Mallya when asked about the budget cap. "It should have happened a few years ago, but better late than never. "Having been announced by the F1 Commission, I think we should all work towards actually making sure it happens. "When this was first proposed [in 2009] there was a mechanism put in place to police it. "OK if people want to cheat and be dishonest they can, but I wouldn't necessarily say any team principal who signs off on [the budget cap] would then push the envelope. "Once you are agreed and all together it is almost incumbent upon a team principal to make sure the rules are followed. "Self-governance is better than imposed governance." Asked whether that meant the teams, rather than the FIA, should police the budget cap, Mallya said the details were less important than the idea itself. "It can be both; it can be one, the other, a combination of the two," he said. "That is the least of the problems."